Smoking Kills. We all know it….yet Does it have any benefitial correlation? Smoking is a strong risk factor for premature atherosclerosis, atherothrombotic events and cardio-vascular death. Curiously, smokers with acute myocardial infarction have lower short-term mortality rates than nonsmokers. 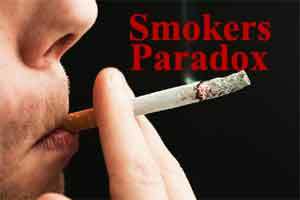 Smokers paradox relates to the benefits of smoking on the final outcome of Acute MI, probably because smokers suffer their myocardial infarctions on average a decade earlier than nonsmokers. This smokers paradox was again revisited, in recent study by Symons et al sought to investigate the influence of CV risk factors including smoking on infarct severity and post-infarction left ventricular (LV) remodelling. The study focused on 471 acutely reperfused ST-segment elevation myocardial infarction (STEMI) patients studied using cardiovascular magnetic resonance (CMR). An MRI was done at median of 4 days after STEMI and repeated after 4 months (in 383 patients) to assess, among other things, area-at-risk, infarct size, myocardial salvage index (MSI), microvascular obstruction (MVO), intramyocardial hemorrhage (IMH), the latter being a marker of irreversible damage to the coronary microvasculature and an independent predictor of adverse LV remodeling and clinical outcomes in STEMI. Nearly half (48%) of patients were smokers and they were about 10 years younger than the nonsmokers and less likely to have diabetes. Unexpectedly, smoking was found to be an independent protective predictor against post-infarct adverse LV remodeling consistent with the “smoker’s paradox.” However, this was so only in those without Intramyocardial haemorrhage at baseline. The investigators concluded that in patients with reperfused STEMI, smokers had a higher incidence of baseline IMH but consistent with the “smoker’s paradox,” smoking appeared to be protective of post-infarction LV remodeling. This is the first study to show an independent and strong association between smoking and IMH occurrence in a large STEMI cohort, said the authors. Further studies are warranted and needed to better understand the potential mechanisms behind these findings. Symons R, Masci PG, Francone M, et al (Bogaert J, senior author). Impact of active smoking on myocardial infarction severity in reperfused ST-segment elevation myocardial infarction patients: the smoker’s paradox revisited. Eur Heart J. 2016; epublished Jan 24.